Ohio-born attorney who became Lincoln’s friend and legal associate on the Eighth Judicial Circuit in Illinois. In 1861, Weldon was appointed a U.S. Attorney by President Lincoln. Weldon remembered how as a young attorney “with what confidence I always went to him because I was certain he knew all about the matter and would most cheerfully help me and would most cheerfully help me. I can see him now,”Judge Weldon said decades later, “through the decaying memories of thirty years, standing in the corner of the old court-room, and as I approached him with a paper I did not understand, he said: ‘Wait until I fix this plug for my gallus, and I will pitch into that like a dog at a root.’ While speaking, he was busily engaged in trying to connect his suspender….”2 In August 1865, Weldon wrote in notes for a speech to the Springfield bar: “In travelling on the circuit he was in the habit owing to his regular hours of rising earlier than his brothers of the bar…on such occasion he was wont to sit by the fire having uncovered the coals[,] and must ponder and soliliquize wisper [sic] no doubt by that ths strange psychological influence which is so poetically described by Poe in the raven — On one of these occasions at the town of Lincoln the year of his nomination sitting in the posture described he quoted aloud and at length the poem entitled mortality.”3 Weldon recalled that Lincoln remembered the words of the entire poem – but not the name of the author – William Knox. Ewing himself recalled that this initial “appearance made a strong impression on me….Mr. Lincoln came over from the courthouse to the hotel where the lawyers put up, as we used to say, while attending court. Stephen A. Douglas, who was then making a campaign in defence of the Kansas Nebraska bill, was at the hotel. Judge Douglas presented me to Mr. Lincoln, and said: “Mr. Weldon is a young lawyer from Ohio who has come to make his home in Illinois.” Mr. Lincoln was very cordial, and, shaking hands with me, replied: “Well, I hope he will find he has made a good trade from Ohio to Illinois.” 7 While Weldon was in Bloomington, when there were discussions of a debate between Lincoln and Senator Douglas – proposed by Lincoln friend Jesse W. Fell. Douglas objected. Weldon told Senator Douglas: ‘Judge, I think you are right. : Fell added: “Well, perhaps you are…still I think that some other time it may be appropriate.”8 Although Douglas and Lincoln would eventually speak on the same day in Bloomington, the more publicized debates of 1854 occurred in October in Springfield and Peoria. I replied that Mr. Lewis was still in his old home, and clerk of the court, as he had been for many years. “Young man, do you see that gun?” Mr. Lewis admitted he did, very frankly. 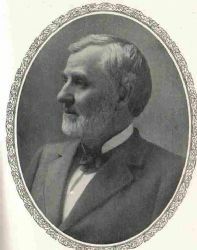 Weldon was one of many Lincoln’s legal friends who urged the appointment of Judge David Davis to the U.S. Supreme Court. “Friends of Judge Davis demanded the appointment as a matter of justice and reward; they admitted frankly their estimate of Lincoln’s indebtedness to Davis,” wrote historian David Silver.10 Weldon wrote Ward Hill Lamon: “Dear Hill, if justice [is] to be respected, Lincoln can do nothing less than to tender the position to Judge Davis.”11 Eventually, but not without effort, Davis’s friends prevailed. In 1883, President Chester Arthur appointed Weldon to the U.S. Court of Claims, where he served until his death.